Implementing comprehensive communications and outreach programs to consumers, health care providers, and others stakeholders who will benefit from the advantages of health IT. To meet these new responsibilities, ONC has been reorganized. The new structure will enable the office to develop and oversee programs and regulations and successfully accomplish the mandates of the Recovery Act. 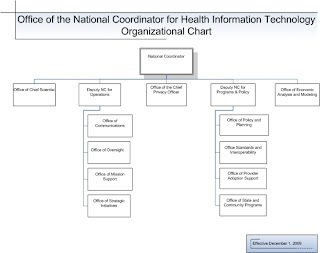 The Office of the National Coordinator for Health Information Technology (ONC) is directed by the National Coordinator and is assisted by the Deputy National Coordinator for Operations, the Deputy National Coordinator for Programs & Policy, the Chief Scientist, the Chief Privacy Officer, and the Office of Economic Modeling and Analysis. Within the Deputy National Coordinator for Operations are: the Office of Communications; the Office of Oversight; the Office of Mission Support; and, the Office of Strategic Initiatives. Within the Deputy National Coordinator for Programs & Policy are: the Office of Policy and Planning; the Office of Standards and Interoperability; the Office of Provider Adoption Support; and, the Office of State and Community Programs. The Office of Strategic Initiatives to oversee internal strategic planning, special projects, and budget formulation. The Office of Economic Analysis and Modeling will provide analyses to the National Coordinator, including advanced modeling of the U.S. health care system for simulating the micro- and macroeconomic effects of investing in health IT. The Office of the Chief Scientist will be responsible for research and for identifying innovations in information technology that can be applied in health care settings, and which will be the ONC interface for international activities. The Office of the Chief Privacy Officer, a position mandated by the Recovery Act, will advise on privacy, security, and data stewardship of electronic health information and coordinate ONC’s privacy and related efforts with similar privacy officers in other Federal agencies, State and regional agencies, and foreign countries.